unleashthegeek: Horikita Maki takes the train! In mid-July, at around 6pm, Horikita Maki was spotted at Shibuya Station dressed casually in a long-sleeved shirt, loose-fitting jeans and sneakers. Maki was with a woman who seemed like her manager. They got off a train on the Saikyo Line and headed to the fare-adjustment machine before exiting the station, most likely to NHK where she is currently filming 'Umechan Sensei'. A witness commented,"Never in my dreams did I even think a top-notch actress like Horikita-san would use the train to get around." So why is a leading actress in movies and dramas travelling in this manner? "This is an effect from Kuroki Meisa's shotgun marriage to Akanishi Jin. After the shock announcement, planned events were cancelled and sponsors started cancelling commercial contracts. These amounted to losses of several hundred million yen. Because of that, the agency has been trying to find ways of saving money, even if it's a little. 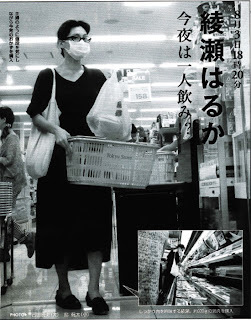 It seems that there has even been occasions when Horikita rode a bicycle to the set of Umechan Sensei," explains a writer for a weekly magazine. and also making headlines, Ayase Haruka shops for her own groceries on 3rd August. Couldn't it be that the best way to get around the city is to take the train? -___- In such congested cities, taking the train can be the best way to avoid traffic jams. I don't think it has anything to do with Jin&Meisa's marriage. Besides, Mak-chan had taken the train lots of time before. She's not a snob who refuses to take the train. She's down-to-earth! She's one of us. U go, Mak-chan!